Panic! is down to two members but back to its unimpressive, boring basics. Creativity can be an slippery creature, especially if you've made your bacon in one more or less immutable fashion. For a band like Panic! at the Disco, creativity can be damning - at least in the eyes of mercurial music fans. The band debuted with A Fever You Can't Sweat Out in 2004, a record that flirted with some rather eclectic influences but played it really close to the emo chest. Long-winded song titles ("There's a Good Reason These Tables Are Numbered Honey, You Just Haven't Thought of It Yet") revealed the pretentiousness beneath the terrible songs, with tracks like "I Write Sins Not Tragedies" getting heavy rotation on Myspace music players. Ditching the exclamation mark for the next record was a tough move, but tougher still was the loss of quite a few squealing, whining fans. While I found Pretty. Odd. to be an "acutely innovative piece of music," the album was largely rejected by those expecting more of the same eyeliner and misery. Oops. As if on cue, Panic! 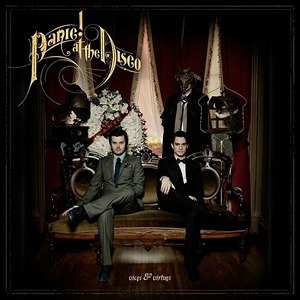 at the Disco returned the exclamation mark to its rightful place and ventured back to some pretty safe ground with Vices & Virtues. The new record finds the band down to a duo, with Brendon Urie and Spencer Smith manning the fort. To say that Vices & Virtues is safer than Pretty. Odd. would be an understatement. While the latter came packed with jubilant Beach Boys-inspired meat and Muppet Show-inspired drama, Vices & Virtues does little to separate itself from the majority of run-of-the-mill rock albums floating aimlessly through the charts these days. Take the lead single, "The Ballad of Mona Lisa," for instance. It's as commercial and bland a rock tune as you can find. The paint-by-numbers arrangement is lifeless, with Urie's delivery right back to bland basics. It's a formulaic, uninspiring bore. It's the presence of songwriter and guitarist Ryan Ross that wounds Vices & Virtues the most, however. With him now helming The Young Veins along with former Panic! bassist Jon Walker, the remains of the band just don't cut it in the songwriting department. The team effort spark behind Pretty. Odd. helped build Urie into a valuable, theatrical presence, but I'm not convinced he's got the chops to replace Ross in the long run. Tracks like "Memories" are steeped in the same flavourless broth as the songs on Fever. "Sarah Smiles" represents a rare bright spot. It sounds like a gleeful holdover from Pretty. Odd., but it still exemplifies the sort of progression that a band like Panic! needs to invoke in order to have staying power beyond the teen/tween girl set. While the majority of Vices & Virtues is an ideal soundtrack to depressing food courts and high school halls, "Sarah Smiles" luckily and fearlessly drops in some horns and a chipper, adventurous chorus that feels...well, good. Imagine that. So there it is. Vices & Virtues is an effort to win back those fans "turned off" the Beatles-esque Pretty. Odd., that much is clear. What isn't clear is why Urie and Smith felt they needed to impress such a capricious bunch in the first place, but I guess self-esteem is a funny thing after all.